At Connected Camps, we offer live, online programs in coding, game design, digital arts, and esports, and we list all our programs on Outschool. In our workshops, students interact with other kids (and our experienced instructors) in real time. 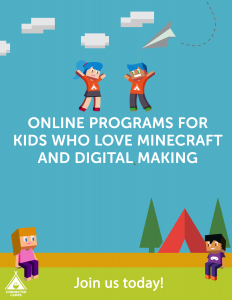 We’ve designed a range of program content and format types to cater to diverse interests and schedules, while also providing opportunities for kids to both sample different topics and go deeper into the things that interest them most. But if you’re new to our programs, you might find all your choices a bit overwhelming. We wanted to clarify some of the biggest questions we’ve been getting on our programs, so you can picture the different paths your child could potentially take as a Connected Camps student. In this post, we’ll tell you a little bit more about the topics we offer, then explain why we’ve designed our system with so much flexibility. We’ll also we’ll share two stories of Connected Camps students who took decidedly different paths when they joined our programs. One-session workshops – These one-time, introductory courses are some of our most popular programs, and they’re specifically designed for kids to try something for the first time. These workshops are perfect for students who are exploring different topics in Minecraft and esports, ranging from coding to game design. With our one-time workshops, they can get a small taste of a particular topic (NEW WORD) without having to a commit to a longer course. Our one-day workshops follow a set curriculum that includes a mix of discussions and learning time with project-based assignments. When you see, “1-Session, Live” in the title of the course, you’re looking at a one-day workshop. Camps – These are online summer camps (or school holiday camps) that follow some sort of theme, and typically run every day for a short period of time, usually over 5 weekdays. Every camp is a brand new program, so your child will always begin the camp with a new set of classmates. The curriculum progresses from day to day within the camp, and it builds on the knowledge of your child learns the day before. Camps are also more project-based or community-focused than our longer courses. For example, in our upcoming theater camp, students will work together to create a play (including a storyboard and characters) and then they will perform that play within Minecraft. These programs usually include “5-Sessions, Live” in the title of the course. Courses – These are longer classes with multiple sessions that focus on a particular topic. For example, we offer a month-long class called “Intro to Architectural Design.” Our courses are focused, condensed programs that offer lots of instruction and structure, but also include plenty of hands-on time for the kids to apply what they’ve learned. In our schedule, these classes always say “4 Sessions, Live” or “8 Sessions, Live” in the course title. 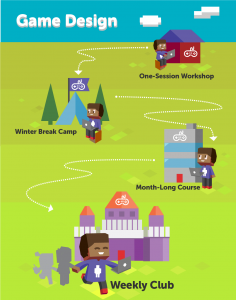 Clubs – We’re excited to offer ongoing clubs at Connected Camps, too. Right now, we have 5 clubs, and each one is a topic-oriented, ongoing program. You pay a weekly fee to get access to that club for 1 day/week. Our ongoing clubs are designed for kids who have an interest in a particular topic, want to learn with other kids who share their interests. We think of these as our “kid-driven” programs, where the counselor gives the students challenges, and then students work together to complete that challenge. The counselors offer feedback and guidance as they’re working on the latest challenge. You can picture our clubs as “sandbox” spaces where kids can apply what they’ve learned with the help of counselors and other students. In our calendar, all our clubs include “Ongoing, Live” in the course title. For most of our the topics we teach (like Game Design), we typically offer a couple of different course types for that topic. When you look at our full program schedule – especially if you’re new to Connected Camps – you may feel overwhelmed for a moment. But we have specifically designed our programs with lots of flexibility and tons of choices, so you can choose the options that work best for your child’s schedule, interests, and educational needs. If your kid doesn’t have a lot of time over the summer, then summer camps might not be the right fit…but they might love taking a month-long class that meets twice a week. 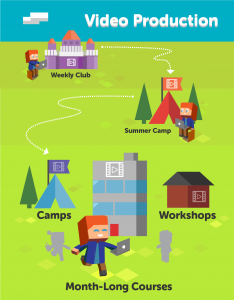 If your child would love to dabble in a bunch of different topics within the Connected Camps world, they can do that, too! We have lots of one-day introductory programs that help students figure out their passions and interests. Right now, the only prerequisites are for courses that say “Level 2,” so your child can pick a topic they’re interested in, and then choose a course type that suits their needs. 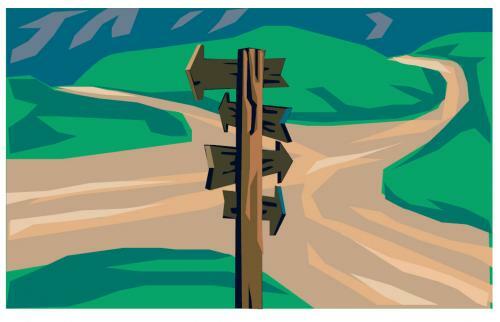 Let’s take a look at different possible pathways for exploring our programs. Steve came to us with an interest in technical topics, like coding and game design in Minecraft. The first course Steve chose was Introduction to Game Design, a one-session workshop, so he could check out the topic a bit more and decide if he liked it. Steve continued learning about game design by joining our 5-day Game Design camp (during winter break) and the month-long Game Design course. These days, Steve’s parents know he’s passionate about game design, so they’ve enrolled him in our ongoing Game Design Club. That club is the perfect place for Steve to use the knowledge he’s gained so far to develop his own personal projects. In the ongoing club, he gets feedback from his counselors on the games he’s building, and is part of our online community of other game enthusiasts. Lissa took a very different path to Connected Camps programs. She already knew she was interested in creating video projects, so she jumped right into our Video Club in Minecraft. In that club, she learned from her counselor and her fellow students as they worked on projects together and shared their skills. During club time, she started learning about other Connected Camps programs, and she saw the skills other kids had learned from taking those courses. She was particularly interested in the videography summer camp, which other students raved about. She signed up for that camp (in conjunction with continuing to attend the ongoing club) so she could immediately apply what she was learning to her projects in the club. Lissa was so excited about her great experience in Videography in Minecraft camp that she then decided to sign up for additional one-day workshops and month-courses, to explore even more of her Minecraft, media, and creative interests. With our highly varied program schedule, you can create a completely customized experience to suit the needs of your child. We know kids are busy, and we know you need flexibility, so your child can explore the topics they’re excited about right now. You can check out our full schedule here, to look at all our course offerings for the next few months. Hopefully this post has helped you select the right starting point for your child right now – but if you still have questions, we’re here to help! We’d be happy to talk through your options with you, and help you pick the right programs for your child. You can email us at hello@connectedcamps.com or call 323-287-5580 to chat with a member of our staff.